POET Grain focuses on the relationship with their “customers,” the hard-working farmers in their local communities. It’s an organization that encompasses 27 biorefineries in seven states, buys 570 million bushels of grain that will provide feedstock to produce 1.6 billion gallons of ethanol per year. For Dean Watson, POET Grain, the entity that buys grain for POET’s 27 biorefineries, represents something much bigger, and much more important than just numbers. While the seeds of POET Grain date back nearly a decade, POET decided the time was right in 2013 to make a major move – a move they hoped would strengthen the company’s biorefining business by consolidating grain buying from 27 entities to one. The process has not been easy, and has required everything from implementing new accounting practices to revamping existing corn bidding methods to communicating these changes to a customer base of thousands of grain sellers. That effort has already yielded positive results for POET– things like more efficient use of capital, utilization of specialized resources, greater market opportunity and diversified grain portfolio returns. Those tangible results – things like a more analytical approach to the market when it comes to buying grain – continue to improve, according to Watson. Those involved with POET Grain have also seen something less tangible, but maybe more important – an increase in communication not only across the company, but also with their customers, the farmers. Just as important to POET, the new system should benefit the farmers who bring bushels to those biorefineries, sometimes from 100 or more miles away. In a business in which grain buyers would normally be considered customers, POET has long taken the opposite view and treated the grain sellers – the farmers – with the highest level of customer service. “This is a relationship business,” says Watson. “POET Grain allows us to communicate better with farmers. Instead of just saying ‘This is our price,’ we can also explain why it’s our price, and they appreciate that straightforwardness. Today, a full biorefinery doesn’t have to turn away potential grain sellers. 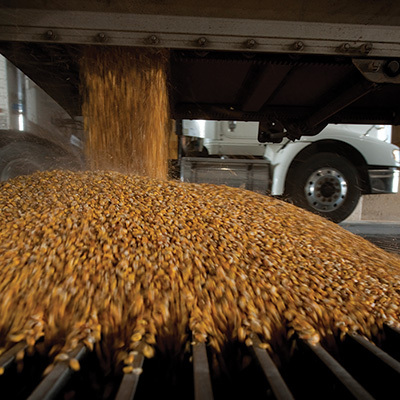 When it comes to buying those 570 million bushels of grain per year, POET Grain’s new structure allows the company to communicate with each biorefinery to provide information like overall market conditions and ethanol margins. They can trade grain into secondary markets or – and they’ve already seen examples of this – move bushels from one POET facility to another, which is a win/win scenario for both POET and the producer.